Station Grove was built in 2006. Mayor Mark Ward and local representative William Carey at the vacant houses on Station Grove. THE MAYOR OF South Dublin has said that six homes lying idle in Clondalkin is “scandalous”. Station Grove in the town is a small private development that was built in 2006 number of years ago and has since remained vacant. 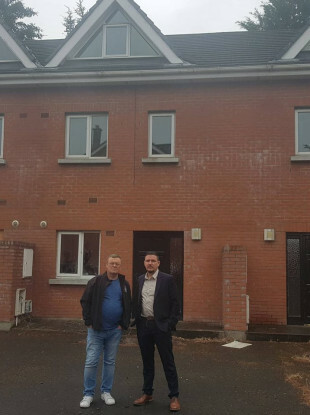 Sinn Féin councillor and mayor of the county Mark Ward says that having six built homes empty at a time when 8,000 people are on South Dublin’s housing list is not good enough. That was confirmed by South Dublin County Council in a response to Ward. The council said that the sale of the homes did not go through. Ward says the homes were being investigated under the Vacant Homes Strategy, but says the outcome of that investigation is unknown. He added legislation is needed. Census 2016 identified 80,000 vacant homes across the country, however, Housing Minister Eoghan Murphy said many of these may have been empty due to a house being in the process of being sold or let, adding the figure could be closer to 25,000. CSO figures this year put that closer to 1,000. Email “'Six houses vacant with 8,000 on the housing list is scandalous'”. Feedback on “'Six houses vacant with 8,000 on the housing list is scandalous'”.